Rogelio Polesello studied at the Escuela Nacional de Bellas Artes Manuel Belgrano and the Escuela Nacional de Bellas Artes Prilidiano Pueyrredón, both in Buenos Aires. In 1959, he joined the Asociación Arte Nuevo, founded by Aldo Pellegrini and Carmelo Arden Quin. The paintings he included in his first solo exhibition at the Galería Peuser (Buenos Aires, 1959) followed the aesthetics of Op Art and were based on Gestalt theories. Their geometric forms, generally in black and white, added to or subtracted from the whole according to perceptive principles that produced specific optical effects. Around 1962, Polesello briefly joined the group Boa, whose members followed neo-surrealism. Under their influence, he produced gestural works that he presented at the Galería Rubbers (Buenos Aires, 1962). 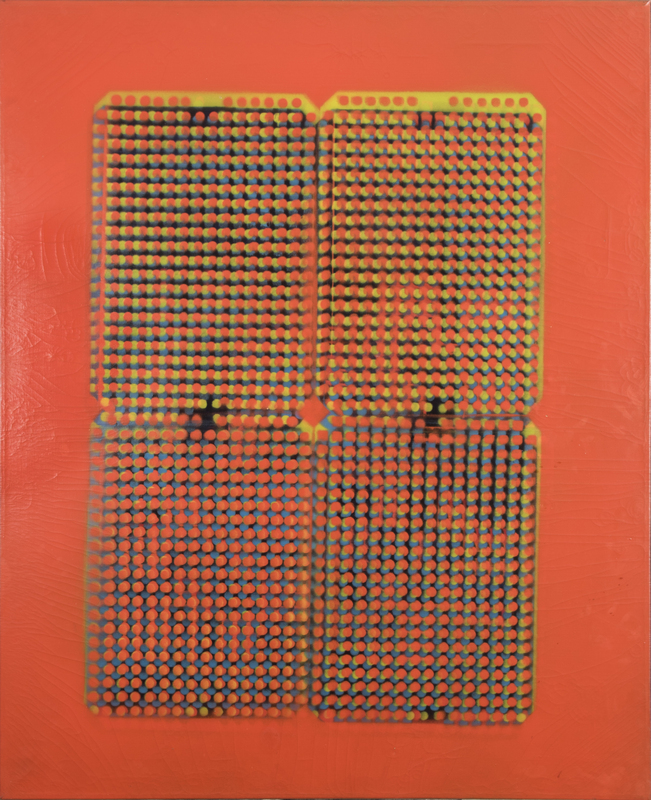 From this time on, he used grids to print plots on his cloth supports by painting over their cracks and orifices with oil, acrylics, or industrial enamels. He frequently superimposed or combined these plots, producing shades and displacements that created optical instability. For Faz A, a work from this time, he obtained first prize in the Salón Esso de Artistas Plásticos de América Latina (Panamerican Union, Washington, 1965). 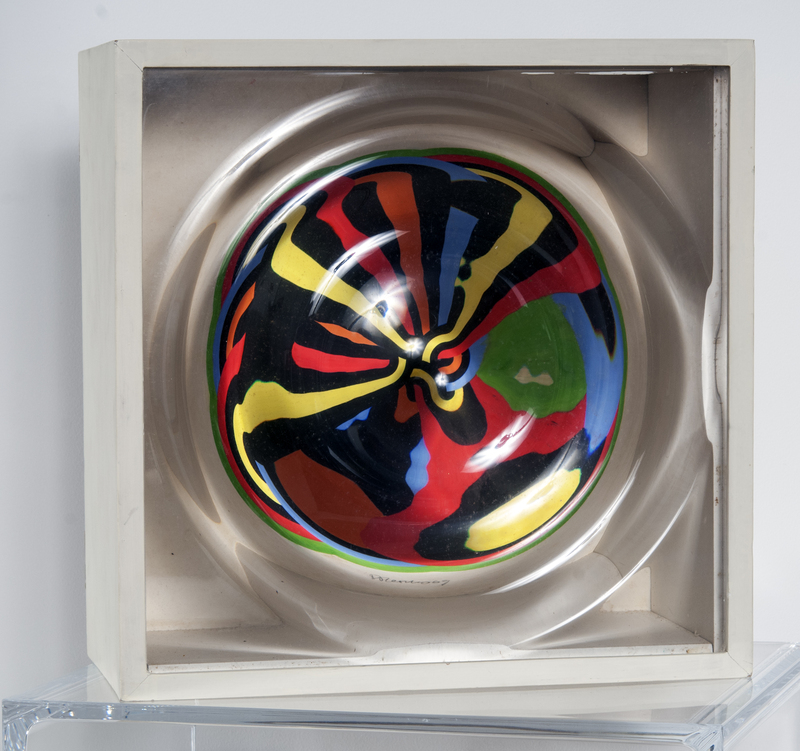 From the mid 1960s, Polesello made acrylic sculptures in small and large format. Sometimes he carved forms on acrylic laminates, producing the effect of multiple magnifying glasses and kaleidoscopes, and he also constructed sculptures with clear acrylic that contained volumes of color in the interior. At other times he combined his drawings and paintings with these acrylic forms, modifying how they were perceived. Some of these objects were displayed in 1966 at the Galería Bonino (Buenos Aires) and at the Museo de Bellas Artes (Caracas). One of them was awarded the Prize Georges Braque in Buenos Aires, in 1968. In the 1970s, Polesello returned to the geometric forms of earlier paintings in works that depicted flat or three dimensional surfaces. In these new paintings, his technique was precise and the finishing had an almost industrial appearance. Over time, the geometry of his works became more and more complex, including ambiguous spaces and volumes, exuberant coloration, plots and textures, and effects of fragmented and multiplied light, as if each work were a virtual system of prisms, lenses and mirrors. In 1981, Polesello participated in the activities of the ephemeral group Abstracción Sensible, which was in favor of the artisan’s work and art’s decorative sense and against the mathematical rigor of the abstract-geometric tradition. In the following decade, Polesello accentuated the baroque aesthetic of his work, incorporating different sources, such as the duplication of the work in a fragment. His work further evolved synthesizing colors and the suppressing volumes. A retrospective of his work was presented at the Museo Nacional de Bellas Artes (Buenos Aires, 2000) and it later traveled to several Latin American museums. Polesello created several works for architectural settings, among them the large mural made for Elaiza’s International Airport in Buenos Aires. Rogelio Polesello lives and works in Buenos Aires. Asociación Arte Nuevo– Group founded in 1955 by Aldo Pellegrini and Carmelo Arden Quin, who were joined among others by Juan Melé, Luis Tomasello, Eduardo Jonquières, Gregorio Vardánega, Martha Boto and Rogelio Polesello. With the goal of researching and spreading modern art, they published (until 1958) a periodical newsletter and they organized the Salón de la Asociación Arte Nuevo (Hall of the New Art Association), which was held annually until 1961. The infiltration of informalism at the events organized by the Asociación put an end to its activities. Boa- Group of artists brought together by the critic Julio Llinás in 1958 with roots in the Grupo de los Siete Pintores Abstractos (Group of Seven Abstract Painters), with a name that referred to the Cobra group. The common interest of its members (which included Martha Peluffo, Víctor Chab, Josefina Robirosa, Osvaldo Borda and, for a brief period of time, Rogelio Polesello) was the synthesis between surrealism and lyrical abstraction, which they sought to promote through a magazine of the same name and a collective exhibition program. The group stayed together until 1963. Grupo de la Abstracción Sensible- Group that in 1981 advocated a free abstraction, gave relevance to decorative elements and promoted a return to handicrafts. Some of its members were: Carlos Silva, Raúl Masón, Rogelio Polesello, Manuel Espinosa, Alejandro Puente, Gabriel Messil, Carlos Silva, Enrique Torroja and Luis Wells.